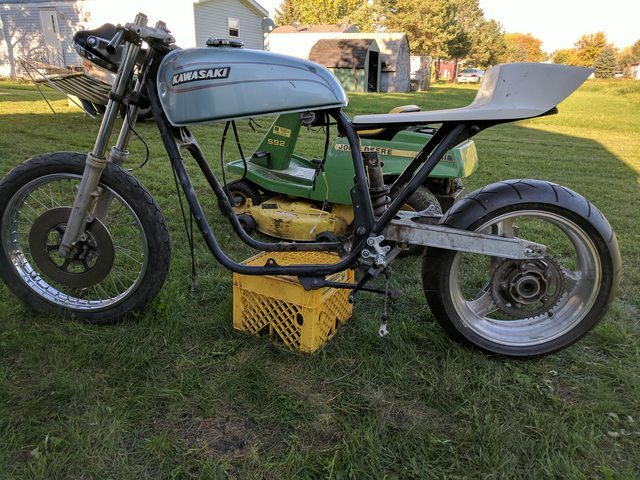 Not sure if this is the best place to put this, but I do want to build something similar to a race bike, so it seems fitting. I Have a 78 gs750 titled frame that I had bought for it's engine. It sat around for awhile and i decided I would try and use some of the other parts I have to build another bike. 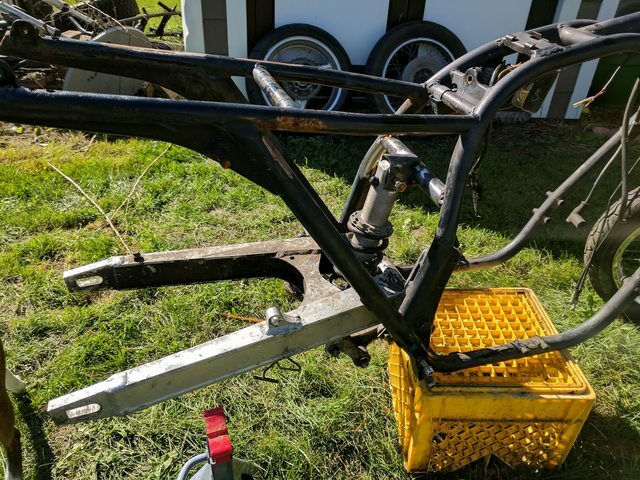 The plan is to build a bike like a vintage race bike, just with some upgrades. I'm also throwing around the idea of a full front fairing. It has a swingarm and shock from an early GPZ600, and i'm still trying to figure out what i want to do for a wheel, or the front end. I have a 750 motor that's torn apart, and the barrels are rusty, so I need to figure out what i want to do for a motor. Take the time to put the 750 back together, or find something else that can fit in it's place. Picked up a 41mm front end off of an 09 ex650. I do have the wheel with it too, just not pictured. I plan on swapping stems with this one, as the 650 stem is too large for a bearing swap. What you should really do is get a set of Wiseco k844 pistons and bore them into that cylinder, you did post in the race-ready section after all! Even for a good healthy street bike, that would be mandatory. Those pistons, especially with a set of megacycle cams or webcams, really make an awesome screamer! As far as the monoshock, I'm never really a fan of Monoshock conversions, as none of us are as smart as the factory engineers that design them, and so many of them end up with subpar structural traits or even lacking the fundamental proper ratios and leverage angles. 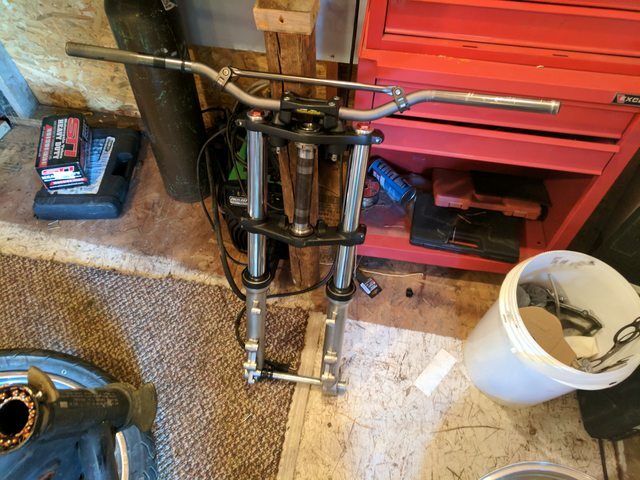 One needs to find a mono shock system from another bike and copy it completely and EXACTLY as far as positions, dimensions, angles, leverage ratios, etc if it will even fit in that frame and not interfere with the carbs or engine. It is a well known vintage bike, and there are a myriad of vintage high-end shock absorbers which would likely ultimately result in a much better ride quality because they are engineered for that type of suspension geometry on that bike particular bike and properly valved and sprung for that setup already. Without sending the monoshock off to racetech with a very lengthy worksheet of all sorts of measurements, angles, and spring and unspring rider-loaded and unloaded weights filled out, and spending a fortune getting custom piston/valving and spring for that application, the twin shock is going to end up being the better choice because you can easily get shocks that are valved and sprung properly for that exact application without going the custom route and having the suspension builder re-engineer a shock for the bike. The frame will require a lot of well-engineered bracing if you use that particular Monoshock setup in it. It seems as if you are quite the ambitious type though so I definitely see you pursuing this further. The only other highly viable options for engines in that frame would be a GS1000/GS1100E/GS1150 engine, which they are very pricey, or a Z1 / KZ1000 engine, also fairly pricey, or possibly a KZ650 or KZ750E engine. I believe those two have the same carb and exhaust spacing as the GS750/850/1000 // Z1/KZ1000. I am going off of the exhaust spacing needed to clear the frame cradle. I doubt you should try to modify the frame for a Honda/Yamaha/etc as fitting a properly proportioned engine is far easier and will likely result in a better build in the end.